7 February 2019 Unlocked content from the archive. The titular Baz and Benz are a pair of owls: a small blue one and a larger green one. 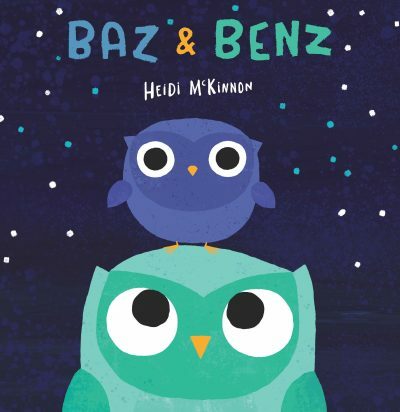 At the start of the book, they agree wholeheartedly that they are ‘bestest friends’, though this becomes a contested fact once Baz puts Benz through a rigorous test: Would they still be friends if Baz turned purple or chirped ‘Meep!’ continuously, or pretended to be a scary bat? The long-suffering Benz is slightly put off by all these strange conditions, but his refrain is a constant and reassuring, ‘But I’d still be your friend if …’ Those familiar with Heidi McKinnon’s previous book, the memorably titled I Just Ate My Friend, will be delighted to see this new picture book, which is stylistically similar in design with its simple block colours and cut-out shapes. When Baz and Benz speak to each other, their words are colour-coded to match their plumage, which is a helpful early learning device. It’s ideal for the preschooler set and is a sweet paean to the enduring nature of friendship and sticking by your friends despite any irritations and problems that may be encountered. For such simple illustrations, McKinnon imbues wonderful highly demonstrative facial expressions in her main characters (for example, surprise, irritation and fondness), sure to appeal to young readers who are starting to develop their own emotional vocabularies.